DNEPROPETROVSK, Ukraine -- In a cramped kitchen that smelled strongly of cabbage and beets, a small army of women labored into the night, preparing what would become dried borscht to supply Ukrainian soldiers in the field. Members of the Dnipro-1 volunteer battalion in Pervomaisk, Ukraine. One Ziploc bag of the borscht, which looks something like wood chips, can feed 10 men and is distributed as a type of Ukrainian meal ready to eat. “Who in the Ministry of Defense is going to make borscht?” Tatyana V. Sirko, an obstetrician volunteering on a recent evening, said. In late summer, with rebel fighters on the run from a concerted government drive, Russian troops and military equipment poured over the border and launched a devastating counterattack, stopping the Ukrainians in their tracks. A shaky truce declared in early September has averted all-out war. But as NATO documents the arrival in recent weeks of another invasion of Russian armored columns, artillery units and elite troops, the country is bracing for a new assault. While the Ukrainian government maintains that it is prepared for any sort of attack, the preparations are veiled in secrecy that many fear is a cover for weakness. 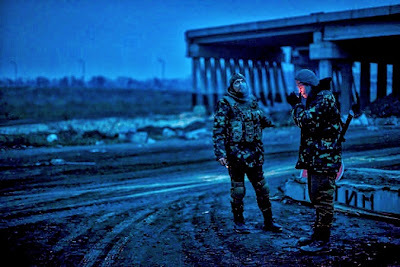 Most of the open fortification for the troops is coming now from volunteers, who offer not just moral and physical support but at least a glimmer of hope that the Ukrainian forces can hold their own against what appears to be a vastly superior force. Powering the Ukrainian war effort, teams of volunteers, most of them women, work around the clock at a logistics center to send an array of products — bottles of homemade pickles, sets of handmade underwear and commercially available military equipment, like night vision scopes for rifles. In one room, a man stacked hand-sewn ballistic vests, peculiarities of the war in Ukraine, a nation with a rich tradition of handicrafts but a woefully underfunded military. Others at the site sort sleeping bags, miniature wood stoves and wool socks. Volunteers tackle even seemingly core military tasks. One group of civilian mechanics in the town of Zhovti Vody repairs trucks and armored vehicles, ancient heaps that break down regularly. “Our guys, our men, are defending the country, our country, and everything depends on them,” said Natasha L. Naumenko, a travel agent who organizes the operation. “They need a strong spirit,” Ms. Naumenko said of the troops. The volunteerism is most pronounced in Dnepropetrovsk, a sprawling industrial city just 150 miles from the front that serves as a main logistic point in the war, but it is spreading throughout Ukraine. In the western city of Lviv, residents drop money in a donation box in the shape of a tank. Inspired by the dried borscht operation here, which produces 2,000 servings a week, similar kitchens have opened recently in Kiev and Odessa. Volunteers are also fighting — 15,000 to 20,000 irregular combatants in about 30 volunteer battalions active in the east. “Without us, the situation would be far more grievous,” Vitaly G. Feshenko, a former furniture salesman and deputy commander of the Dnipro-1 volunteer battalion, said in an interview. “We are lawyers, businessmen and housewives,” he said. Serving in one of his units, for example, is a former cellphone store accountant who fights under the nom de guerre “The Accountant” and is rumored to be widely feared along the front. While this dedication to defending the country may warm the hearts of Ukrainian patriots, it also reflects the dismal state the military has fallen into, haphazardly equipped by a bankrupt government and receiving only minimal, defensive-oriented aid from the West. With talk rife of an imminent rebel offensive, senior Ukrainian officials put on a brave face and never pass up an opportunity to reiterate that their army is ready. On a recent visit to the front lines, however, the soldiers seemed to be lacking just about everything, including such basics as fuel and warm coats. In the past two months, he said, plans “came to fruition” to supply the army. And yet Ukraine’s post-Soviet army has for years been unraveling amid corruption and mismanagement. The Kiev Post newspaper printed a graphic detailing the origin of one soldier’s personal equipment. All but the Kalashnikov rifle and a pair of summer boots was either donated or purchased by the soldier. In Kharkiv, a group of men build prefabricated plywood shacks, more comfortable in the cold than tents. Enthusiasts of drone photography donate their buzzing machines, teaching soldiers to use them to see over hills and around buildings. Stories abound of families scraping to buy protective vests for a son or a nephew. “What is wrong with our government?” said Anastasia S. Kuznetsova, 22, a social worker in Dnepropetrovsk, who helps coordinate donations. At one sandbagged redoubt on a November morning, soldiers stood around a campfire, slathering toast with a tart, homemade cranberry jam. “It’s a people’s army,” Mikola I. Fakas, a private, said. Of those who donated the jam, he said he was very grateful. Volunteers are allowed powerful weapons like .50-caliber rifles and antitank rocket-propelled grenades, but are not provided factory-made armored vehicles. On the Ukrainian side of the front, monstrous vehicles made from vans welded with steel plates rumble along the roads. In what volunteer groups point to as grim evidence of their rising importance in the Ukrainian war effort, the man who organized the volunteer mechanics, Ivan D. Veliki, an Afghan war veteran, was killed this month in a sophisticated attack. He was shot by a remote-controlled gun planted in a parked car that then burst into flames. Nobody has been arrested in the killing. Russian news media routinely vilify the proliferation of nongovernmental military organizations, dismissing them as the private armies of Ukrainian oligarchs, and to be sure, wealthy industrialists do play a big role. So do the legions of do-it-yourself enthusiasts in Ukraine. Sewing, embroidery, gardening and canning are traditions that run deep in Ukraine. In the Soviet era, gaps in the consumer economy created these experts throughout the former Soviet space. At Ms. Naumenko’s collection point on a recent evening, a woman showed up who had sewn from nylon camouflage fabric two pouches just the right shape for Kalashnikov magazines to fit snugly inside. One group of women sews boxer shorts, each with a distinct floral print pattern.